The Thinkers Press is a small independent publisher located in Davenport, Iowa, USA. TP has been publishing a steady stream of chess books of varying quality over the last twenty years or so. Since the early 90s, they have produced a series of books of the writings of C.J.S. Purdy. Purdy was the man in Australasian chess for almost fifty years, editing a series of magazines, perhaps the best known being Chess World. While never achieving the GM title, he did win the Australian Championship several times, and played in an Interzonal once. He also was the first ICCF correspondence World Champion, so the guy did know a little about chess. His contemporaries asserted that his over the board practice suffered due to the pressure of editing and writing a monthly chess magazine. While Chess World was notoriously late, it always eventually came out, and usually 60-90 % of it was written by Purdy himself. His reputation as a chess writer of extreme clarity was widespread, but his books, and the magazines, being printed in small numbers in Australia, were hard to come by. The first two volumes put out by TP were pretty much straight reprints of existing Purdy books, The Guide to Good Chess, and The Search for Chess Perfection. Both are quite good, with the Guide currently in print again, and TP promising to reprint Search next year. On the Endgame is more representative of the other Purdy books TP has produced - it was not a book written by Purdy per se, but rather a compendium of columns from his magazines that have been compiled as a book. If the writing is of a high enough quality to warrant separate publication, this is not a bad thing, but one should be aware of this going in. 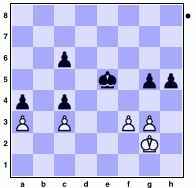 The Short Course consists of four chapters, Rook and Pawn versus Rook, Pawn Endings, Queen Endings, and Practical Endgame Studies, spanning some sixty pages. Each chapter is a series of articles concerning one common topic which should be pretty much apparent from the titles. This section, while instructive, can hardly serve as a replacement for a serious endgame treatise such as that by Keres or Fine. Each piece concerns a small part of the topic covered. However, the reason Purdy is worth reading is his remarkable ability to clarify and communicate fairly sophisticated concepts in a readily understood manner for players of all classes. The Rook section is 17 pages. Of course, Dr. Nunn wrote an entire 350+ page work on this same subject. Nonetheless, in his 17 pages, Purdy does an excellent job of explaining the most important concepts of this critical ending. The basic winning and drawing techniques are well covered, as well as the far side/near side issues, bank rank defense, etc. Now, we all know how this little trick works. I first became acquainted with it in Znosko-Borovskys endgame book wherein he names it the trebuchet. Purdy too uses the sobriquet, which raises an interesting question - who used it first? Unfortunately, OTE doesnt give any information as to when these columns were written. It could have been Purdy. Clearly, here he who moves first wins, but what an elegant way to look at this problem. Proof of this is to put the White King on g5 rather than g8. Now using Purdys rule, one can see immediately, without any calculation, that Black wins the e6-pawn no matter whose move it is. This is the essence of Purdy. He can distill his knowledge and write it in such a way that one immediately grasps the concept, and more importantly, will remember it. The reason Purdy writes at length on this is not so much that it is an interesting ending, and it is, but rather to write about the various wrong analysis published about it, starting with Blackburne himself, and progressing through Znosko-Borovsky, Steiner, Fine, etc. 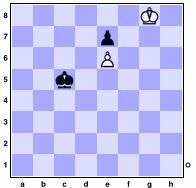 Ironically enough, when he is on the verge of finding the truth, Karsten Mueller steps in and makes a small correction to Purdys analysis (Mueller, co-author of the prize winning Secrets of Pawn Endings, and Fundamental Chess Endings, has supplied several corrections, presumably computer assisted, to the text). That this many well-known and respected players and authors could make a mistake in analyzing this endings suggests it may be worthy of study. The only nits I have to pick with this work are the aforementioned lack of historical attribution, and the absence of any kind of index. I realize, especially with a small independent press, these would increase the size, and thus the cost, of the work. I still think they are worth including. If you are familiar with other TP titles, most of the cute touches are absent here - no boxing of text found in the main other than the rules, no little aphorisms or cartoons. Some like this type of thing, some dont, but I must say the over all impression one takes away from this volume is one of professional presentation. This book should have something of interest for players of all classes. It can be used to reinforce, or even learn for the first time, certain basic endgame principles. It presents many quite interesting games and positions that one probably has not seen before, as many are taken from Australian-New Zealand tournaments from the 40s/50s/60s. And perhaps most importantly, Purdys ability to charm and entertain shines through from virtually every page. Recommended.